Mix all the ingredients and form into a loaf. You may need 1 to 1 1/4 cup of oatmeal mixed with bread crumbs as a binder. It depends on your meat and how moist or dense you want it. Add a smidge of salt and pepper, or any other seasonings you like (you can do basil and oregano or anything else, if your tomato sauce is plain). Spray the West Bend with cooking spray and put the loaf in the middle. Surround meat loaf with small chunks of skin-on potatoes and sprinkle with lemon pepper. You can also add canned or frozen green beans, if you like. Put on setting #4 and cook for approximately 2 hours. Move to setting #5 for about 15 minutes, to crisp it up. Alternately, you can probably cook this in the oven at 350 degrees for an hour or so. Notes: This is adapted from a verbal recipe from Linda, on how she does her in the oven. I adapted for the West Bend. 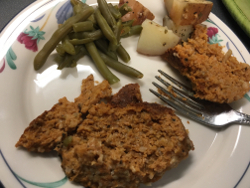 Gail usually uses red skinned potatoes and frozen whole green beans.